In current, contemporary times, I find myself getting more and more into post-metal type music and bands. Sure, I have always had an awareness of a few good, select acts, but it seems that there has been a noticeable increase in such as of late. One of my recent discoveries is Switzerland’s atmospheric phenoms UNHOLD and their just-released (Nov. 9th) full length for Czar Of Crickets Productions, ‘Here Is The Blood‘. What I was really somewhat surprised to learn was the fact that this is apparently their fourth album, following the previous offerings ‘Towering‘ (2015), ‘Gold Cut‘ (2008), and ‘Loess‘ (2004). Let’s cut right to the chase, I am a sucker for anything that is stylistically symbiotic to the band Neurosis and their music. And, make no mistake, UNHOLD are unquestionably devotees to the influence of Neurosis, but at the same time are a superbly unique, set apart entity. One that is forging their own way forward with music that is both experimentally driven, as well as flat-out freaking fantastic! The quintet that comprise UNHOLD – Miriam Wolf (piano, vocals), Philipp Thöni (guitar, vocals), Daniel Fischer (drums), Reto Wittwer (bass), and Thomas Tschuor (guitar, vocals) – are an immensely talented, creative collective. What they create is haunting, emotionally eviscerating, atmospheric post-metal with tempestuous doom / sludge enhancements. With a trio of players providing vocals that include both male and female, the band is able to tap into a whole other aural plane opened up by this verbalized accentuation alone. With those projections added to the instrumentation, the music of UNHOLD is second to none, as evidenced by such magnificent song constructs as “Attaining The Light“, “Curse Of The Dime“, or “Altar“. To be honest, I would almost like to avoid drawing your attention to one song or another, for the simple fact that I think the best possible scenario is someone sitting down and delving into ‘Here Is The Blood‘ as a whole. Doing that will give you / them a totally immersive experience, one where the listener is taken on a spectacular sojourn to an altogether different place. ‘Here Is The Blood‘ is able to do exactly that too, pulling you into a realm where light and dark, hope and bleakness, delight and despair, and so, so much more are all present. They are transmitted via the airwaves in these opulently dynamic sounds, and since I have already singled out certain tracks, allow me to reveal some of the other finer moments to be experienced. The tracks “Hunter“, “Pale“, and “The Chronic Return” are all quite captivating, yet, for me there are two tracks in particular that just cannot be outdone. The irony may be the fact that both are the very first songs I’d ever heard from UNHOLD recently, ones that appear back-to-back on the record too, “Convoy” and “Deeper In” (video). These are the fiercest, finest offerings for my tastes, with the hypnotic lull of the “Deeper In” music augmented by Miriam’s alluring, mesmerizing vocals. As for “Convoy“, I believe I could listen to it on repeat endlessly for hours… and about have! The powerful grooves it emits, while the harsh vocals bellow, and that damned irresistible crescendo that builds before they scream out “Here is the blood!“, damn, damn, damn! So intense, so immaculate. 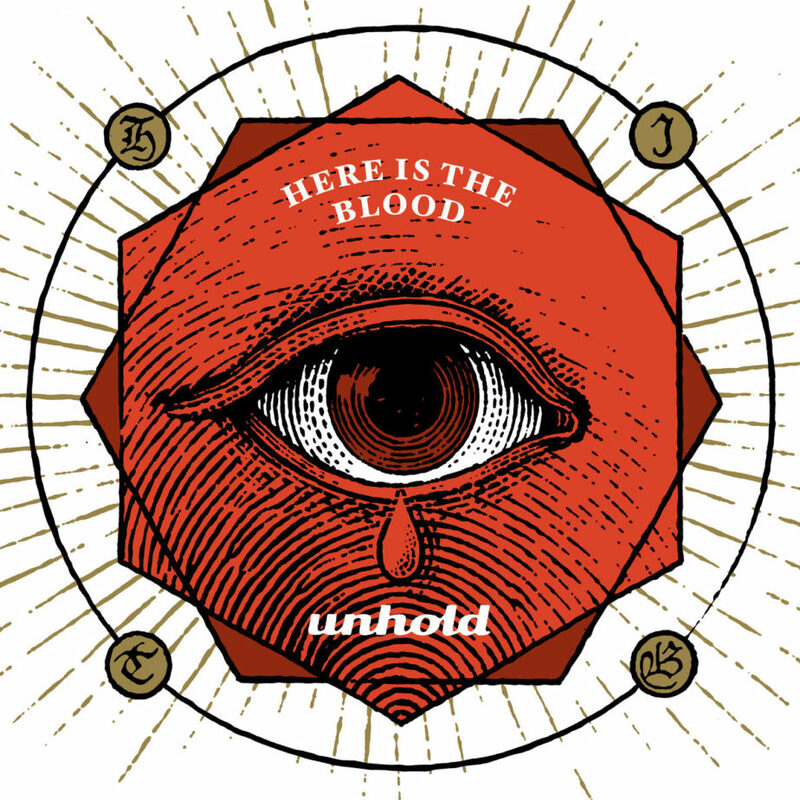 Don’t take my words here as the gospel truth, you MUST hear and experience the ‘Here Is The Blood‘ album from UNHOLD for yourself – and in one sitting, start to finish if possible. I assure you this though, you will be moved. But, if I have somehow misjudged things, then call for the undertaker because you are dead, my friend. Yes, I believe it to be impossible to hear this album and somehow, be devoid of an emotional reaction to it. Find out how you fare now via the stream provided in this review.